Detoxification is essential to optimal health: if toxins build up in our bodies, our systems cannot function at their highest levels. For this reason, it’s important to flush them out on a regular basis. Keeping your body detoxified over the long term is as simple as eliminating processed junk, including sugar and wheat flour, from your diet, and instead eating nutritious meals made with whole, organic ingredients. Focusing on raw fruits and veggies is key, as are regular exercise, stress relief and quality sleep. To amplify your body’s natural detox processes even further, try adding a “golden shot of health” to your daily routine. There are only six ingredients in this wonder tonic – each one packs a huge punch, and together, they are virtually unstoppable. Remember, for best results, and especially for detoxification, use only organic ingredients. The shot described below is great for healthy adults. If you have a health condition, or are considering this shot for older children or teenagers, talk to a health professional you trust first. 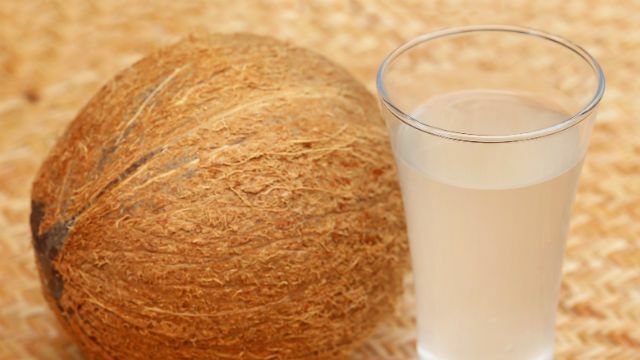 Coconut water, which is the sap found inside a coconut, is a super-hydrating, mineral-rich liquid. Just a few of the minerals found in this amazing water include potassium, iodine, selenium, manganese and zinc. Coconut water is also rich in B-vitamins, antioxidants, enzymes and amino acids, all of which combine to rejuvenate the body. This water is linked to hydrating and alkalizing the body, lowering blood pressure and blood sugar, improving digestion and boosting metabolism. Raw honey in itself contains a world of benefits, and manuka honey is widely considered to be the healthiest of all. It is derived from wild manuka trees, which grow across certain remote areas of Australia and New Zealand. The manuka tree itself is the key to the honey’s potency; it contains antibacterial, antiviral and antifungal compounds. The antibacterial power of manuka honey has been analyzed, and found to be 200 times stronger than any other honey in the world. Besides stopping many pathogens in their tracks, this honey supports healthy gut bacteria (which are key to immune health as well) and provides important nutrition. When choosing manuka honey, make sure you get the real thing. It should have a UMF (unique manuka factor) rating on the jar: the UMF scale goes up to 20 percent of the honey’s total content. The higher the UMF, the better the honey. Lemons are known for their high vitamin C content. Vitamin C is a potent antioxidant that is imperative to the health of the immune system – and for skin, hair and nail health. This vitamin is also linked to lowering heart disease risk by slowing or stopping the progression of atherosclerosis (the hardening of the arteries) in diabetics. Besides vitamin C, lemons contain several B-vitamins, along with the minerals calcium, copper, iron, magnesium and potassium. They have an alkalizing effect on the body, are known to provide an energy boost, and are one of the best liver detoxification foods out there. Cinnamon, besides being absolutely delicious, is rich with essential oils and antioxidants. Some of the volatile compounds that cinnamon contains include cinnamaldehyde, cinnamyl alcohol and cinnamyl acetate. These compounds have been found to have potent antibacterial, antiviral and antifungal properties, making cinnamon great for a detox. Along with helping to lower inflammation, which can greatly lower your risk of disease, cinnamon has been found to help boost memory and cognitive function, lower blood sugar and improve insulin sensitivity. Ginger is best known for its ability to soothe digestive distress, however, it has far more benefits than that. The compounds gingerol and shoga found within ginger give it potent anti-inflammatory properties which help to both detoxify and prevent a host of illnesses. Ginger is also used traditionally for many types of pain relief. This rhizome is one of the most common ingredients in a detox plan, as it stimulates digestion, circulation and sweating. Through these processes, ginger helps to detoxify the liver and colon, to name only a couple organs. Wait… salt in a health shot? That’s right. Our bodies need salt to survive. While refined “table” salt is highly processed, often contains additives, and can be detrimental to health, unrefined, natural sea salt is quite the opposite. It contains trace minerals including calcium, boron, sulphur, sodium, magnesium, silicon, potassium, strontium and bromine. Making unrefined sea salt a part of your diet may help boost cardiovascular function, aid in weight loss, and even potentially reduce asthma symptoms, besides providing the minerals that the body needs. It also helps to hydrate you, and can ease muscle cramps. Just make sure your sea salt specifically says “unrefined,” or it may be less than healthy. 1 piece of fresh ginger root, about 1 ½ inches long. Blend coconut water and ginger root in a blender. Strain into a mason jar through a sieve. Add the honey, lemon juice, cinnamon and sea salt. Mix well. Pour individual shots from the jar into a shot glass, and store the covered jar in the refrigerator. These shots are best when fresh, so it’s not recommended to make large batches. 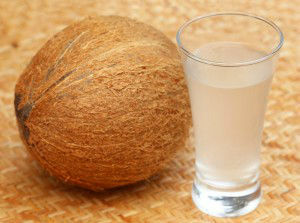 Hey Buddy!, I found this information for you: "The Absolute Best Coconut Water Health Shot EVER". Here is the website link: https://www.thealternativedaily.com/absolute-best-coconut-water-health-shot-ever/. Thank you.